"The KUHL STEALTH SHIRT is cut from luxurious ELUXUR LITE fabric. Woven from 100% polyester microfiber, ELUXUR LITE is peached with an air texture and finished with IONIK to resist odor. UPF 30 provides sun protection. 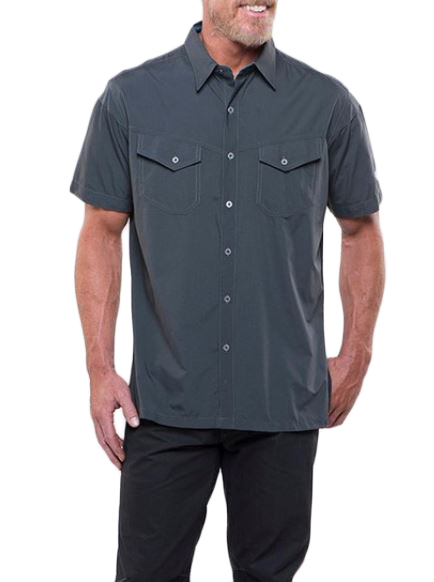 The STEALTH SHIRT features KUHL signature metal buttons in a button front design. Two angled chest pockets with button closures add style, and a security pocket is hidden inside the shirt at the chest. Quick dry, wicking, and wrinkle resistant, the STEALTH SHIRT is perfect for active travel. Easy care, wash and wear.